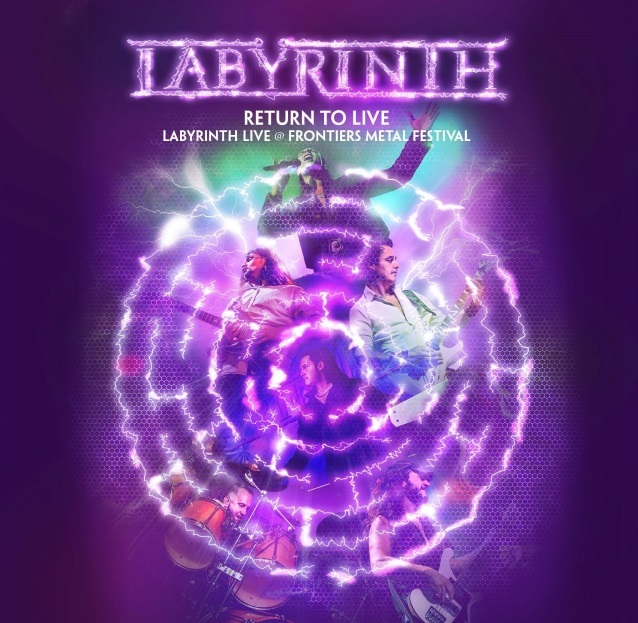 LABYRINTH, Italy's finest purveryors of power/prog metal, held their first reunion show at Frontiers Metal Festival in Trezzo Sull'Adda on October 30, 2016. The revamped lineup played "Return To Heaven Denied", the band's most popular record (so far), in its entirety for only the second time ever. The landmark album was originally released by Metal Blade in 1998 and is considered by many to be one of the highlights of the power metal genre in the late '90s. LABYRINTH's Olaf Thorsen says: "It was a real mix of feelings to play 'Return To Heaven Denied' in its entirety as it was something which we never did before, not even during the many tours we did back in '98-'99! It is even crazier when you think that this was our very first live show with our new lineup, but when we saw so many people from different countries singing every single song with us, we just felt that it has all been worth it. Unforgettable." A recording of the Frontiers Metal Festival performance, "Return To Live", will be released as a CD/DVD and Blu-ray on January 26, 2018 via Frontiers Music Srl. LABYRINTH's latest studio album, "Architecture Of A God", was released in April via Frontiers Music Srl. In the spring of 2016, the band's founding members, Andrea Cantarelli and Olaf Thorsen received a call from Frontiers asking them to discuss with vocalist Roberto Tiranti the possibilities of a reunion with a return to their classic sound to mount a comeback for the band. After much discussion, the guys agreed to make an album and also to make a very special appearance at the the first annual Frontiers Metal Festival. With a new lineup rounded out by drummer extraordinaire John Macaluso (TNT, RIOT, ARK), Oleg Smirnoff (VISION DIVINE, EDRITCH) on keyboards, and Nik Mazzucconi on bass, LABYRINTH has offered up a superb album. "Architecture Of A God" (mixed by DGM's Simone Mularoni) is a record that encompasses all the elements the band is known for: fast power metal songs with unforgettable hooks, epic prog-infused metal songs, and some great melodic numbers that compose a record which is easily another milestone for the Italian metal masters.